Stop that silent thief of power loss! You can't feel them or hear them, but harmonic vibrations are at work inside EVERY internal combustion engine. That's not good. Similar to glass-shattering forces created by a high pitched note, harmonic vibrations cause metal fatigue and can cause significant power loss because crankshaft harmonics are transmitted to the camshaft and valvetrain. Control this power-robbing force with a Fluidampr harmonic damper that uses race proven vibration damping technology. A high viscosity silicone fluid surrounds a nylon-coated inertia ring inside a laser welded housing. All dampers are coated with a black zinc chromate finish for increased corrosion resistance. Timing marks - every two degrees from 50 degrees BTDC to 10 degrees ATDC with additional marks at 90, 180 and 270. Meets SFI 18.1 specs. Made In The USA. 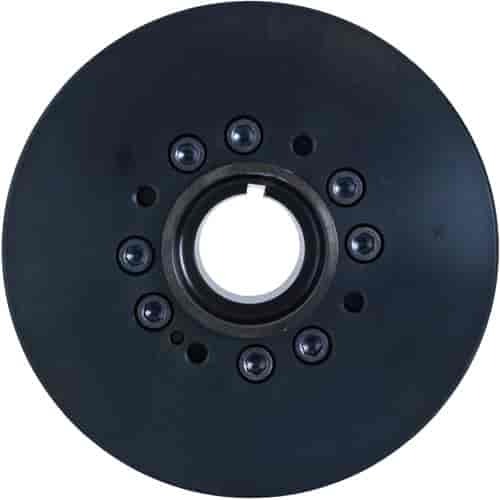 These Fluidampr replacement hubs are designed to fit your existing Fluidampr harmonic balancer. They are made of steel or aluminum and have different finishes, depending on your engine's application. Does Fluidampr 650501 fit your vehicle?